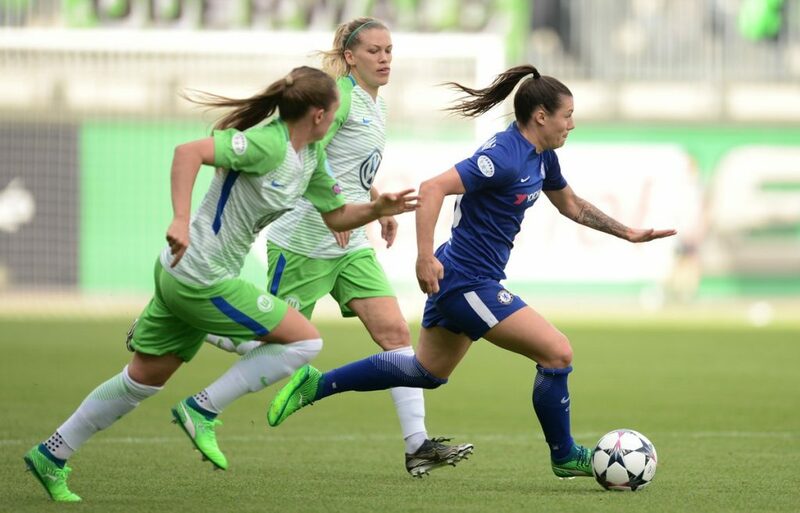 Chelsea put up a battling display in Wolfsburg but lost out 2-0 on the day to goals in the last quarter of the game, bowing out of the Champions League semi-finals 5-1 on aggregate. 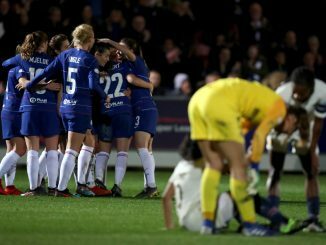 Eniola Aluko put an encouraging early ball into the box for Chelsea which came to nothing, with Wolfsburg immediately breaking with speed and Pernille Harder shooting inches wide. Hedvig Lindahl thwarted Caroline Graham Hansen from close range and a Lena Goessling volley deflected off a team-mate and dropped into the goalkeeper’s hands. Chelsea were a little lucky that the ball just ricocheted off Ewa Pajor in the six yard box from Lara Dickenmann’s driven cross to the near post. Sara Bjork Gunnarsdóttir could not quite get enough on Pajor’s ball to the far post, while Fran Kirby’s ambitious effort at the other end drifted wide toward the end of a goalless first half. Early in the second half, Lindahl tipped over Dickenmann’s angled shot and then came to the rescue with the Blues conceded possession but got away with one when rushing out and missing the ball, as Pajor missed the target. Moments after Aluko should have had a penalty, the hosts were also denied a spot-kick. Fran Kirby was sent away with a great ball by Katie Chapman but Almuth Schult made the save. Pernille Harder opened the scoring on 69 minutes, cutting inside Millie Bright to beat Lindahl on her near post. Payor missed the far post after an error by Ji So-yun but got her goal with a close-range header from Alexandra Popp’s clipped ball in to make it 5-1 on aggregate. 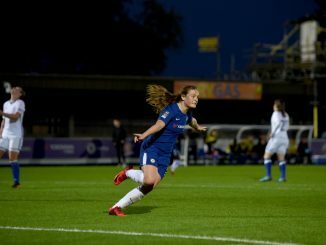 Erin Cuthbert rifled a 20-yard effort at goal but Schult was equal to it, diving to firmly turn it over the crossbar to deny Chelsea a consolation. 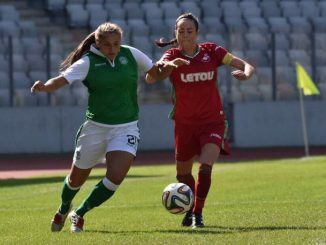 Wolfsburg: 1 Schult, 4 Fischer (C), 7 Gunnarsdóttir, 9 Blässe, 11 Popp, 16 Maritz (27 Kerschowski, 66 mins), 17 Pajor (10 Wullaert, 79 mins), 21 Dickenmann, 22 Harder, 26 Graham Hansen (3 Jakabfi, 72 mins), 28 Goessling.